A tiny blip in the madness that is Chickpet, Dilshad Hotel packs a punch with killer beef biryani and phal. Work your way to the narrow gully that skirts the Kumbarpet mosque and you’ll find yourself in front of Dilshad Hotel. There are a couple of other small eateries in the same lane and they have similar menus but we couldn’t really resist the wafting aromas from Dilshad, so, in we went. The ambience is threadbare and all they’ve got is sturdy benches and tables. The place is usually crowded with people working in the area so find a spot and settle in. Their page-long menu consists of Beef Biryani - a tad spicier than the regular Muslim-style biryani but high on flavour. 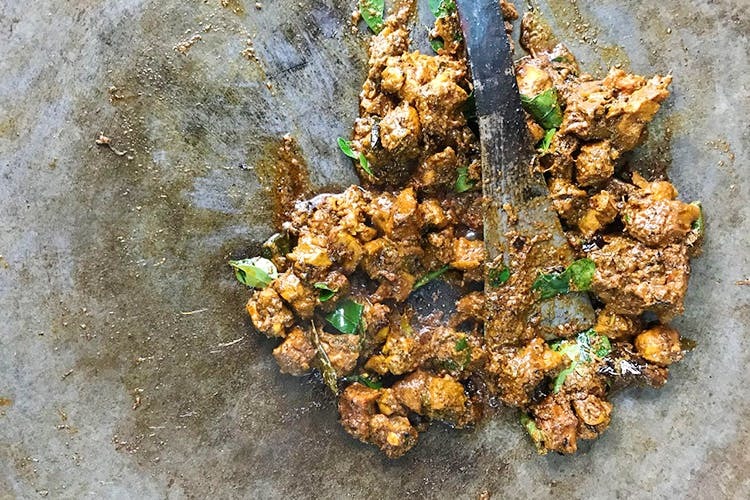 You get a small mound for just INR 60 and you can pair this with the stellar Beef Phal - chunks of meat coated in a peppery masala. The shammi kebab though delightfully crispy on the outside does not have a meaty enough filling to warrant a place on our favourites list. This is a very, very humble joint frequented by blue-collared workers so don’t go expecting a spotless ambience. You can always parcel the food if that’s a more comfortable option for you.